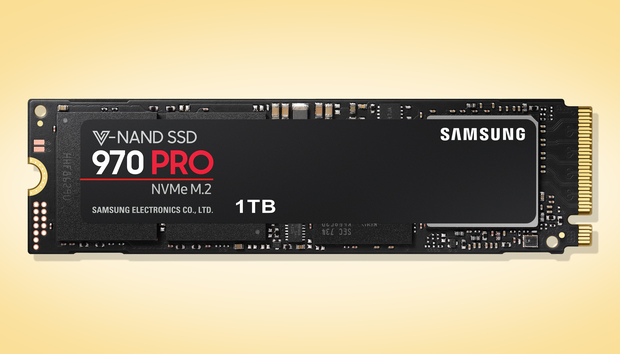 Uneasy can be the head that wears a crown, and recently that’s been Samsung’s pate when it comes to fastest M.2 NVMe SSD on the planet. The company barely held onto its headgear after a challenge from the far-cheaper WD Black NVMe. A response was required. Still, the best never costs less, and the Samsung 970 Pro is what you want if you want the best. The 970 Pro is a M.2 2280 (22 millimeters wide, 80 mm long), NVMe drive that can utilize up up four PCIe 3.0 lanes. “Up to” means it’ll use them if you’ve got them, but can still function with two, albeit at about half the speed. Don’t bother with this drive unless you have those four lanes. The drive uses Samsung’s 64-layer MLC NAND, and the company’s new Phoenix controller to make good use of it. But the upshot of using faster, less data dense (compared to 3-bit TLC) MLC NAND is that there’s no 2TB version of the drive. There’s also no 250GB version, though that’s likely for performance reasons. With SSDs, fewer chips means fewer paths to shotgun data across, often resulting in slower write and read performance. So if you want the 970 Pro (admit it, you do) you’ll be choosing from the $330 500GB version or the $630 1TB version. The Samsung 970 EVO, also announced today, and the WD Black NVMe, cost around $100 less per 500GB of capacity. That’s a difference of around 35 percent. Gulp. If you’re bargain hunting, stop teasing yourself with this review and go read about those. If you’re still with me, the 970 Pro is warrantied for a full five years, and rated for 300TBW (Terabytes Written) per 500GB of capacity, about the same as the 970 EVO and the WD Black NVMe. The TBW rating is the total amount of data that the company says you can write to the drive before you start losing too many cells. Little birds have told me that the industry is pretty conservative in those estimates, and if you divvy up those writes on a per day basis, the ratings are actually far more data than the the average user will write in ten years. We’ve yet to hit the ceiling on any SSD drive we’ve tested over the last few years. 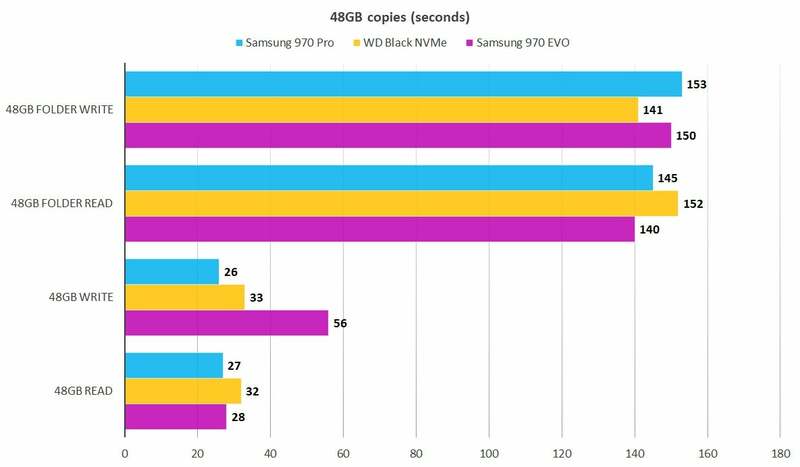 The 970 Pro is the fastest M.2 NVMe drive we’ve tested to date. CrystalDiskMark 5 and 6, as well as AS SSD 2.0 universally proclaimed so, as well as our real world 48GB copy tests. But the margin of victory over the 970 EVO and WD Black NVMe, as mentioned, was too close for comfort. Especially given the disparity in pricing. If this were a horse race, I’d say the 970 Pro won by two lengths at the wire, maximum. The Samsung 970 Pro is clearly the best all-around M.2 NVMe according to CrystalDiskMark 6. Longer bars are better. CrystalDiskMark 6 has changed from version 5 in that it now measures small file performance with various queue and thread depths. This gives a more accurate picture of what’s going on at any given time on your PC during normal operation. 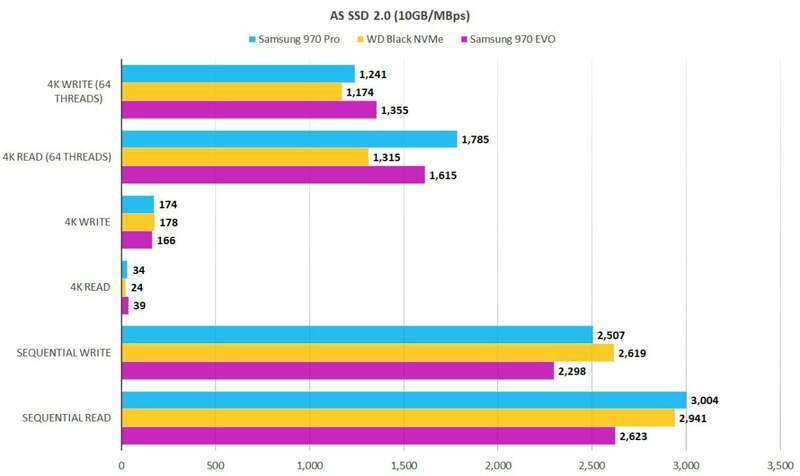 The 970 Pro didn’t win all the AS SSD tests, but it proved the better drive overall. Longer bars are better. Our real world copy tests, shown below, are designed simply to back up the conclusions of the synthetic benchmarks, and spot if there are any major drop-offs during heavy end-user scenarios. It was hardly a blow-out, but the Samsung 970 Pro proved fastest in nearly all the tests we ran. And the CrystalDiskMark 4K results with various thread and queue depths clearly indicate that performance is well-balanced for most end-user workloads. If you want the fastest M.2 NVMe SSD available, that’s the Samsung 970 Pro—no ifs, ands, or buts. But a 35 percent premium is hefty for a drive that’s not all that much faster than its rivals. Check your wallet (and PCWorld’s guide to the best SSDs) and make the call.